Making Dehydrated Chicken Dog Treats is a really easy thing to do. Not to mention how cost effective it is and so much more healthier and safer it is than buying that commercial stuff. They make the perfect snack for you puppy dog and you can eat them yourself! YOU know what your puppy is getting every time. . . no preservatives, chemicals, colors etc. Just plain old real meat! And well, making dehydrated chicken dog treats is super easy! I use an Excalibur Dehydrator﻿ when making my dehydrated dog treats. Always remember, dehydrating is a low and slow process so plan ahead when making these. The #1 reason I love this Excalibur is because it blows the air from the sides which is a much safer and faster process when dehydrating. And as always, use safe food handling techniques when working with chicken. To make slicing easier, I pop the chicken breast into the freezer for about 15 minutes before slicing it. You want to slice the strips with the grain, very thin, about 1/8" to 1/4" thickness. Or you can have the butcher at your grocery store slice it for you. 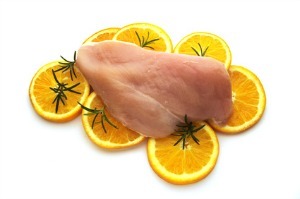 Rinse off chicken breast and remove any fat. Slice the partially frozen chicken with the grain. Cut to about 1/8" to 1/4" thick. The thinner the better and make sure to cut each slice as closely to the same thickness as possible. Pat dry. Lightly coat your strips with the oil. Place the strips in an even layer across the dehydrator tray, leaving an equal amount of space between pieces, making sure they are not touching. This helps keep the air flow moving while being dehydrated. Once the strips are all laid out your ready to load your dehydrator. Depending on the type of dehydrator, use the appropriated setting (meat) or set at 140 degrees. And off you go. Cooking time will vary anywhere from 3 to 6 hours to fully dry. It all depends on how thick you cut your slices and the temperature your machine cooks. I check my strips every hour or so after the first hour. I take out one slice of the dehydrated chicken dog treats, cut it open and check the inside. You shouldn't see any moisture and if cooked completely, the chicken dog treats will have the same color throughout. If not, put that strip back in for another hour and recheck. As your entire batch is getting closer to the end, start checking every half hour to see which ones are done. Your finished dehydrated chicken dog treats should be dry and leathery, or some people like to leave them a bit longer to get crispy. It's really a personal thing on that one. Let your jerky cool completely. Your chicken dog treats may not last long, they don't here, but just in case you need to store them put them in a zip lock bag in the refrigerator for up to 3 weeks. For longer storage, use vacuum seal bags and store in the freezer for up to 8 months. Checking - baking times will vary due to the type of dehydrator used, temperature settings and sliced meat size. Your dehydrated chicken dog treats should be firm/leathery and dry, never spongy or soft. I prefer to let them go a bit more and be a bit on the crispy side just to be safe. Cutting - Once your chicken dog treats are cooled I found that it's much easier to cut them with kitchen scissors or even a pizza cutter rather than using a knife. Storage - Always keep in the refrigerator. Zip Lock up to 3 weeks in the frige. Vacuum seal small portions and place in the freezer up to 8 months. 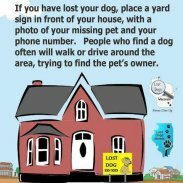 Your Dog Is Waiting . . . . .
Do You Make Homemade Dog Treats? Does your puppy dog drool over the Homemade Dog Treats you make? Does your puppy dog have a favorite one? HEY! Do you have a great recipe you can share? Then why not share it with our readers! 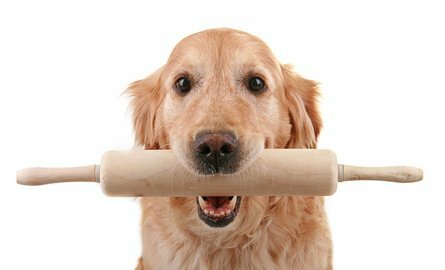 Share your dog's favorite homemade recipe ... Just type it here! ... Please don't use all caps or any HTML as our system strips it out. But don't worry, I'll make it look pretty for you! Tell us what you think! Leave us a comment in the box below.